can you recommend a restaurant in Amsterdam? do you accept restaurant tips from readers? Yes! I love to hear about new openings or restaurants that you’ve recently tried (with positive results!) that aren’t on the site yet. will you come and review a specific restaurant? I get dozens of press releases and invitations to restaurants every week. While I really appreciate hearing about them, there simply aren’t enough meals in the day to visit them all! However, I will generally add them to my “to eat” list for future reference. Amsterdam Foodie is one of the few objective, independent restaurant review blogs in Amsterdam. To maintain this principle, I try to book anonymously and pay for all food and drinks myself. In the few exceptions to this rule, I disclose the fact that I was invited by the restaurant in question when writing my review. All opinions are my own. No – I only write restaurant reviews (and occasional articles about culinary concepts like pop-ups or workshops). I do not review individual ingredients or food brands. No – I am the only author on Amsterdam Foodie. I do occasionally write guest posts for other publications, however. 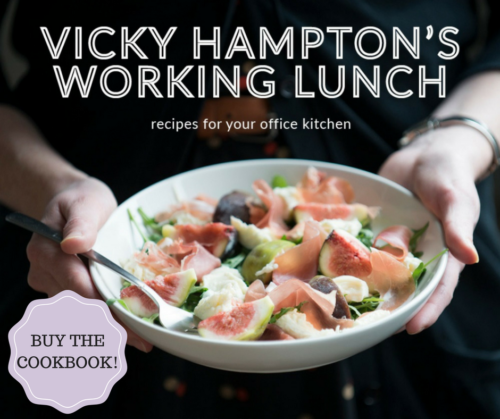 Vicky Hampton’s Working Lunch is a handy, compact lunch cookbook that’s available in both hardback printed and e-book formats. You can buy it via the web shop on this site. how can I keep up-to-date with Amsterdam food and restaurant news? To receive instant notifications of all the latest restaurant reviews, foodie events, articles, projects and related news, follow the Amsterdam Foodie on Facebook, Twitter, Instagram, Pinterest, Google+ and YouTube. do you offer other freelance food/writing services? Yes – when I’m not blogging as the Amsterdam Foodie, I’m a professional copywriter, editor, translator (Dutch to English), social media manager, and marketing/communications consultant. Of course, I specialise in food, but my work covers a range of other topics too – take a look at my portfolio site, VickyHampton.com, for details. Get in touch via email for rates and availability.